It's not what you might call obvious fairy tale territory. Somers Town has a reputation as a rough, tough corner of North London. But look closely at some of the 1930s mansion blocks, often regarded as among the more successful examples of inter-war social housing, and you are in for a treat. Flashes of ceramic magic adorn the facades, and sailing ships make their way across the drying yards. All the work of one of Britain's leading twentieth century artists. Somers Town is generally defined as the area bounded by the Euston and Pancras Roads and Eversholt Street - and has been perpetually knocked around by rail projects, latterly the development of St Pancras International. It's one of those city centre enclaves that are not too well known. It's sizeable enough - the council ward (which takes in some adjoining areas) has more than 13,000 residents - and prestige developments such as the new Francis Crick Institute for biomedical research are starting to intrude. But there's no main road cutting through the area. And while there are pockets of elegant nineteenth century terraced housing, the bulk of the locality consists of sturdy blocks of between-the-wars flats . The first social housing in and around Somers Town dates back well over a century. But the rebirth of the area is largely credited to one man - an Anglo-Catholic clergyman, Father Basil Jellicoe. He came from an elite family (the First World War's Admiral Jellicoe was a relative), was a student at Oxford, and then decided to follow his father into holy orders and was sent as a missioner to Somers Town. He was appalled by the poor housing and overcrowding in damp and verminous buildings. It was not simply a social outrage, he argued, but 'an outward and visible sign of an inward and spiritual disgrace'. 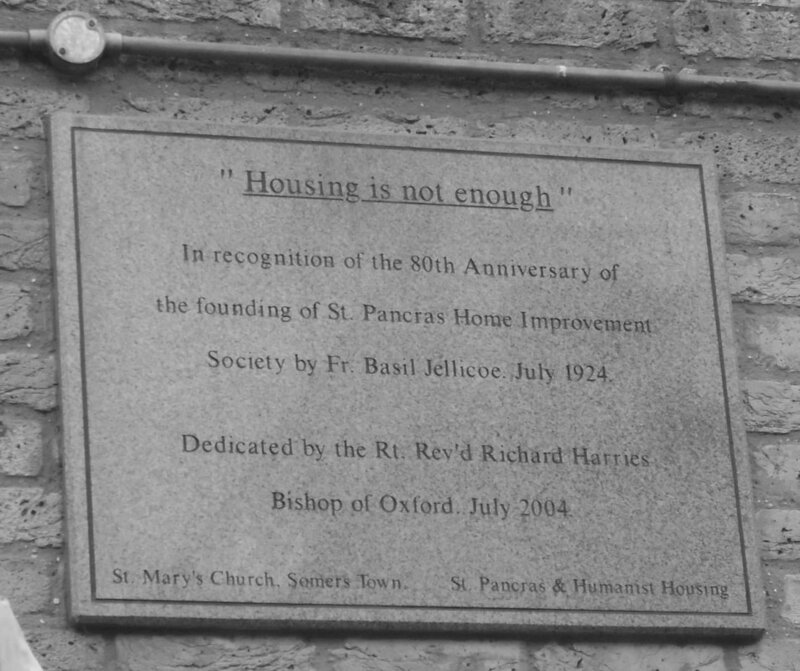 In 1924, he helped establish the St Pancras House Improvement Society - later St Pancras Housing Association and now part of the Origin group which is still based in the area - and used his social standing to gain the attention and support of Queen Mary, the Prince of Wales (later Edward VIII) and the Archbishop of Canterbury, all of whom came to Somers Town to see what Jellicoe was up to. The Prince of Wales even turned up in the local pub - Jellicoe took over management of The Anchor in Chalton Street, simply to ensure that locals had somewhere to drink which was orderly and well-run. Father Jellicoe - often dressed in biretta and cassock - didn't want simply to pull down the old slums, but to build a new neighbourhood for those displaced which was uplifting as well as functional. 'Housing is not enough' was his refrain, a phrase still on display in Somers Town. Jellicoe resolved - said an obituary in The Times - 'that he would not rest until his people had homes fit to live in, and the rehousing schemes started by his society have already provided many excellent flats, with gardens, tress, ponds, swings for the children and other amenities.' And all at a rent no more than tenants were paying for the old, insanitary, housing. The land cleared became the site of the Sidney Street estate - the street itself disappeared altogether in the course of the development. Two months after the initial demolition, Jellicoe blessed the first bricks of flats in the 'Garden Estate', as the Sidney Street development was described. Father Jellicoe's personal involvement with Somers Town did not last much longer. His health began to fail and he died, still in his mid-thirties, in 1935. But his dream was realised. And the Sidney Street estate in particular - 250 flats in blocks all named after saints which were finally completed in 1938 - was a trailblazer. Trees, play areas and communal spaces were provided, and the first block to open, St George's, received nationwide attention as 'the first block of all electric flats in the United Kingdom'. 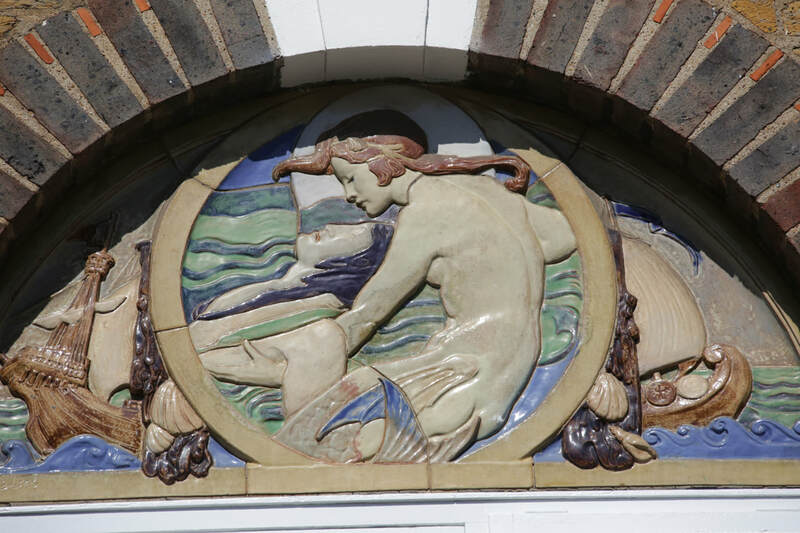 As part of the endeavour to provide fine design, the eminent sculptor Gilbert Bayes was commissioned to provide decorative ceramics. They are there still. Walk around this development - along Chalton, Aldenham, Bridgeway and Werrington Streets - and you can see many of them still, bursts of colour and fantasy amid solid and rather dour facades. Bayes believes that art was for the people and not just the elite and he sought out themes which he believed would have popular appeal. 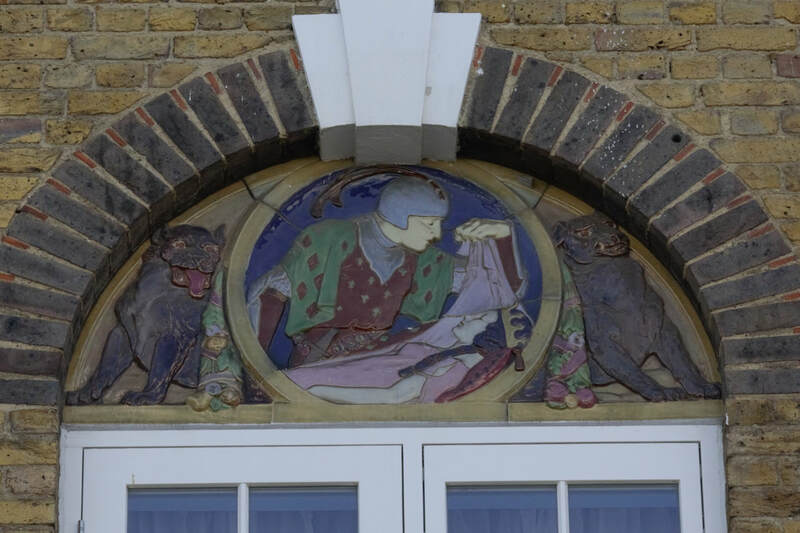 Above the balconied French windows on the second floor of flats, he designed Doulton stoneware lunettes, largely based on the fairy tales of Hans Christian Andersen and the brothers Grimm. You can see scenes from Sleeping Beauty, the Princess and the Swineherd, the Little Mermaid and The Tinderbox. In this same estate, Bayes also designed a marvellous clock depicting the seasons and a statuette of St Anthony on horseback. But this fairy tale doesn't have the happiest of endings. Among the Bayes ceramics on the estate was a beautiful virgin and child for a rooftop nursery school. Shamefully, while these rooms were being converted into flats recently, this exceptional piece of art, so rooted in the history of the buildings, was destroyed and disposed of. Sacrilege! 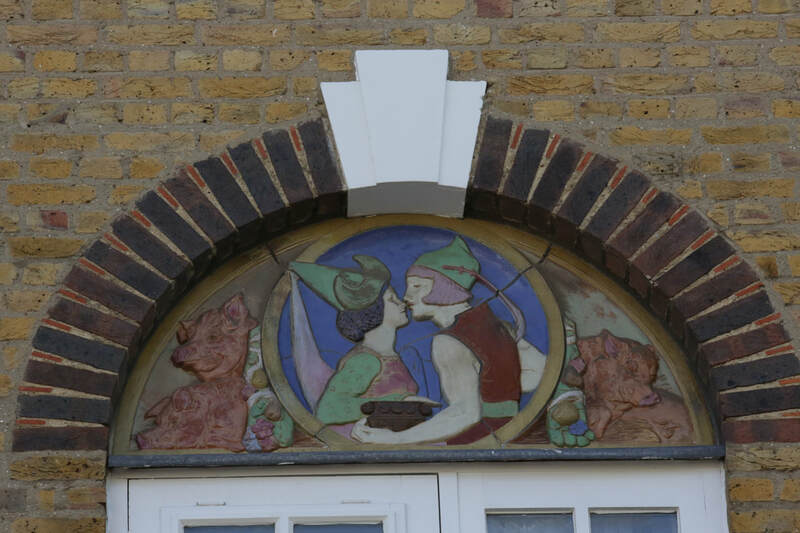 The Somers Town history society has expressed its outrage to Origin, who must bear culpability for failing to safeguard these ceramics. There was another wonderful and whimsical aspect of Gilbert Bayes's commission - he was asked to design stoneware finials for the top of the washing line posts in the drying areas of the flats. Once again, he turned to fairy tales, and also to saints' lives and Christmas carols, for inspiration. The poles were variously decorated with sailing ships, blackbirds, tailors, demons, roses, ducks, doves and snails. These were placed not simply on the Sidney Street estate, but on two other Somers Town estates run by the same housing association - and on their estates elsewhere in North London, in Kentish Town and Tufnell Park. Bayes also sold some of these finials at exhibitions and as garden ornaments for between six and eight guineas each. They now attract a price of about a thousand times that amount. Over the years, all the original finals have been removed - some for safekeeping but it seems most are missing presumed stolen. The current value of the items unaccounted for could easily top half-a-million pounds. Once again, the casual attitude of Origin has horrified conservationists and local residents. A handful of the original ceramics are now on public display nearby at the British Library (at the back of the lower floor). The rest seem to have simply slipped from view, in some cases turning up in auction rooms. 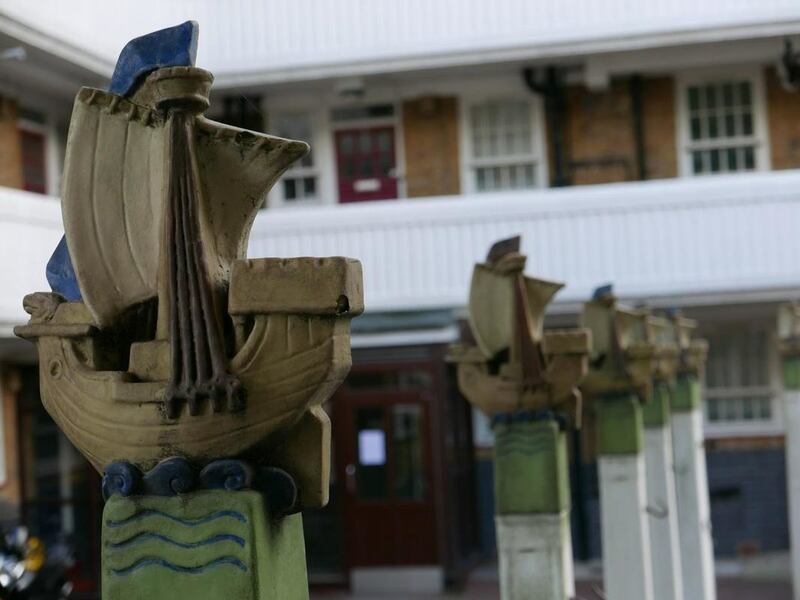 On a more positive note, the housing association has provided replicas to replace a few of the lost ceramics - and so if you venture along Aldenham Street and keep your eyes out, you will see a fleet of sailing ships on top of otherwise naked washing posts, and a central finial of a decorated Christmas tree. There's a similar, smaller, batch of finials visible from Werrington Street. ​On another of the association's Somers Town estates and rather more hidden away - behind the Basil Jellicoe Hall on Drummond Crescent, in the courtyard between St Joseph's and St Anne's flats - doves sit on top of posts, the tallest of which bears a carpenter's bag of tools (Joseph was of course a carpenter). But all these posts are otherwise unadorned - no washing lines, no shirts or sheets drying in the breeze. A resident explained that no one pegs up their washing in the communal area anymore ... because, a bit like the Bayes finials, it gets nicked.